Belfort and Alistair Overeem’s rematch may have headlined Strikeforce Revenge in San Jose June 9 but it was far from the highlight. The sweetness of revenge was left untasted. After the battle the two fought over a year ago and with the notoriety and history each of them brought to the ring, a more explosive fight was expected. What fans got was a ground squabble and a lack of action that provoked the referee to stand them up six times throughout the three-round fight. Overeem chalked up another win over Belfort with a unanimous decision after laying on top of The Phenom for much of the fight. Belfort showed spurts of fire in the first round though. He surprised Overeem early on with a quick shoot and sweep that sent him to the canvas. At one point Belfort had Overeem’s back and was trying to land the rear naked choke. Overeem escaped, turned over, and Belfort swung from a partial mount. Overeem clenched Belfort and his gloves quieted. Going into round two both fighters seemed sluggish. When Overeem went on the attack Belfort would take guard on his back, refusing to continue with the standup bout. The referee stood the two up twice in the second round. Belfort professed after the fight that he injured his left hamstring in the second round. The injury, he said, kept him from continuing on his feet. The story was the same in the third round. When Overeem attacked, Belfort went to his back; Overeem would take the top and then the pair would trade casual blows until they were forced to stand by the referee. They were brought up from the ground another three times before the final bell to end the fight. Brian Warren went to the spout of revenge looking for a drink – his thirst wasn’t quenched either. Cung Le was around the corner stepping on the hose shaking his finger. But it wasn’t Le’s finger or his foot that turned Warren’s dreams of revenge into nightmares, it was his swinging fists. Warren was sure that if he got the MMA newcomer into the cage he could work him over and find the retribution he sought. Warren showed promise with his taunting jeers while Le stared passed a broken nose that sent blood down the front of his face. Le caught the big-headed Warren with a right-left-right combination that stood Warren up like a bouncing buoy in the middle of the ocean. He followed up with a lethal right hand that sent the star-gazer to the mat after 4:19 in the ring. 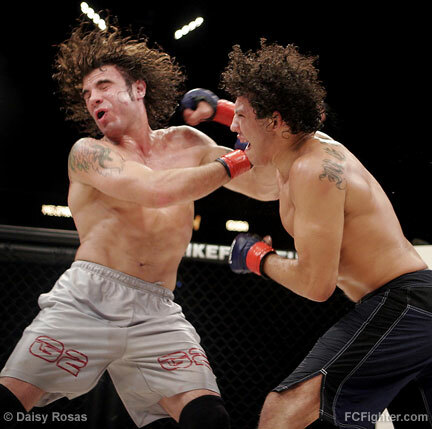 War ensued between Gilbert Melendez and the newly crowned Strikeforce Lightweight champion Clay Guida. The fight was scheduled for five, five-minute rounds and the long-haired gladiators battled through every second of the fight. Melendez hammered Guida’s face from start to finish and Guida came with strong counters and religiously went after Melendez’s legs following his punishing combinations. Melendez came away with the split decision after five full rounds. 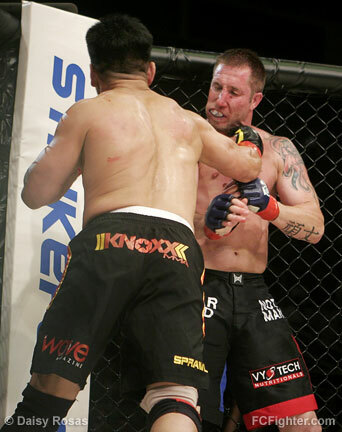 Controversy showed its ugly face during the Light-Heavyweight fight between Bobby Southworth and James Irvin. The two entered the ring poised to rack their horns against one another, and they did – for 17 seconds. After connecting a single left jab to Irvin, Southworth steam-rolled The Sandman through the entry gate and onto the catwalk. The gate attendant scrambled to latch the gate, but it was too late. Over 200 pounds of fighter was being driven his way in front of another 200-pound fighter and there was no stopping the train once it got moving. Flying through the gate wasn’t the problem. It was blood that spewed from his left leg as a result of it. A pool of red blood lay on the black painted aluminum catwalk. The announcer called it an "equipment failure." The referee waved off the fight calling the fight no contest due to Irvin’s inability to continue. Eugene Jackson and Mike Seal had mad respect for one another. The 39 year old, 5′ 8" Jackson had to look up to the 28 year old 6’4" Seal, but after the first few minutes of conflict they realized that the playing field was level and they could get down to business. The two roared like thunder and struck like lighting striking from one side of the sky to another. The see-saw battle left nothing but respect between the two fighters. Seal launched flying knees and swung high kicks at the shorter Jackson, taking advantage of his superior reach. Jackson stepped in between shots and left his mark on Seal’s chin with punishing lefts and rights. Shortly before the end of the first round the two met center ring and shared a high five and a smile. No bad blood, just respect and love for the sport. Jackson caught one of Seal’s kicks and swept him to the ground in the second. He got the full mount and and went to work on the Mexico-native. Jackson landed six consecutive right hands from the mount before the referee jumped in to stop the fight 2:49 into the second round. If it wasn’t for the incident during the Irvin-Southworth fight, Daniel Puder’s 28-second victory over Tommy Tuggle would have been the quickest fight of the night. Puder lost his footing during a high kick attempt. Tuggle grabbed hold and Puder fell to his back. Tuggle moved to strike and the former WWE Tough Enough contestant slapped on the armbar for a quick submission.